While the GenericEvent class is handy for spinning up quick events, it’s also a bit … well … generic. In this video we use a custom event class to tighten up the signatures of our subscribers. So, one last final thing that we're going to do while we're here working with the event dispatcher is create our own event class. 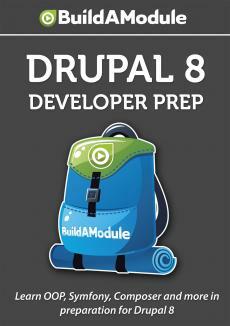 Now, we did this in the Symfony videos, but let's see how we can wire it up inside of Drupal. It's actually pretty straightforward. So, I'm going to go to the resource pack directory, and I'm going to copy this blindd8notableevent. php adding a custom event class. And then I'm going to go back over to our blind d8 folder, and I'm in the source folder and that's where we want this class. Anything that we want to be autoloaded needs to end up in our source folder. So, that doesn't include our YAML files, but it does include any of our classes that we're going to use. So, we're going to rename this blindd8notableevent. php. Let's take a look at what the structure is here. Now, I basically just copied this from any existing event. Any class that extends event could serve as a good sort of boilerplate. If we do a quick search - I'm going to copy this and do a quick search across the entire code base in Drupal 8. You can see we have 24 uses. Here's our example here, but let's take a look at config collection info extending event. I'm going to close out the bottom half here so we can see a little bit more of the code. So, config collection info extends event, and if we look at the full signature - I'm going to open up the structure section - it has add collection as a method, get collection names, and get override service. These all seem like custom methods, and if we look down here, we can see that none of them are overriding parent methods at all. We would see a little green circle with a red arrow on the left hand side if it was. So, we have a lot of freedom in our event here. The event class itself if we follow up the chain, we can just control click this. We're going to go to the core version here. Here's the full signature here. These are all of the methods that get defined inside of the event class. It doesn't really look like there's an awful lot here that we would probably use as we extend an event. I'm sure they're useful on some level, but it's probably not the level that we would need to work in. So, our event - if we go ahead and take a look at it - really only needs to do two things. One, we need to be able to set the string to a new string to override the default, and second we need to be able to get that string back out again. Now, again, we could use properties inside the class, but that's not the best way to do it.